I have been busy as the busiest bee, designing and sewing up a costume-storm for dance and theatre productions these last few months. However, I still happily make time for felt Matryoshka commissions when I’m able to spare a day for doll-making – it’s a great way to catch up on some TV while creating a new little dolly-friend to send into the world. 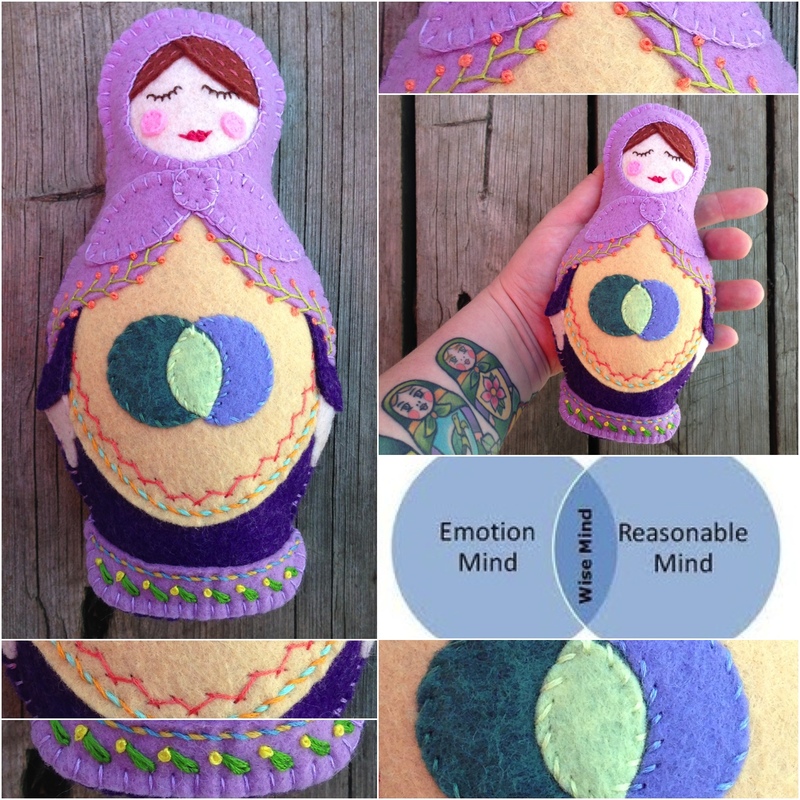 Meet Harriet, the Venn Diagram Matryoshka! She’s science meets craft, and it’s a beautiful thing! 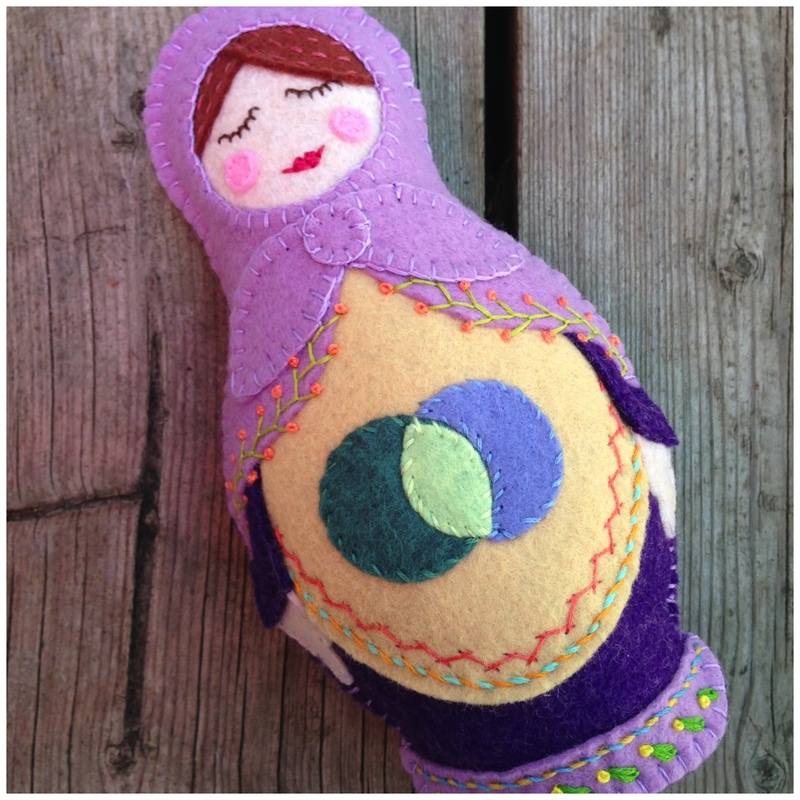 In the 4-to-5-ish hours it takes me to make a Matushka Matryoshka (one of my larger matryoshka dolls), I feel like I get to know the little lady and then I have a bit of a hard time letting go! And Harriet was no exception — though I can trust she is bound for an appreciative home. I love her mix of purples and I added a wide, shallow herringbone stitch in a dark salmon pink to jazz her belly up just a wee bit. I like that her Venn diagram has no details, Harriet will allow you to demonstrate almost anything with her unmarked Venn! Speaking of herringbone stitch … I plan to spend my summer cottaging days working on this sweet princess-and-the-pea sampler from Nicole of Follow the White Bunny. Time to increase my stitch vocabulary! My 4-year-old son has 2 very excellent friends who happen to be girls. Their moms and I have become bosom-buddies through our kids and all 3 of the widgets take creative dance together at The School of Toronto Dance Theatre’s Young Dancers’ Program. I adore having 2 boys and no girls, absolutely no regrets. But I myself am a girl, and I really do love me some cute little skirts and dresses now and again. So I just have to buy or make them for Rudi’s friends when the spirit moves me (he’s long-since informed me that girls wear skirts and dresses, the gender-differentiation train has left the station). And girl birthdays create opportunities to make delicate, girlie things that I cannot resist! 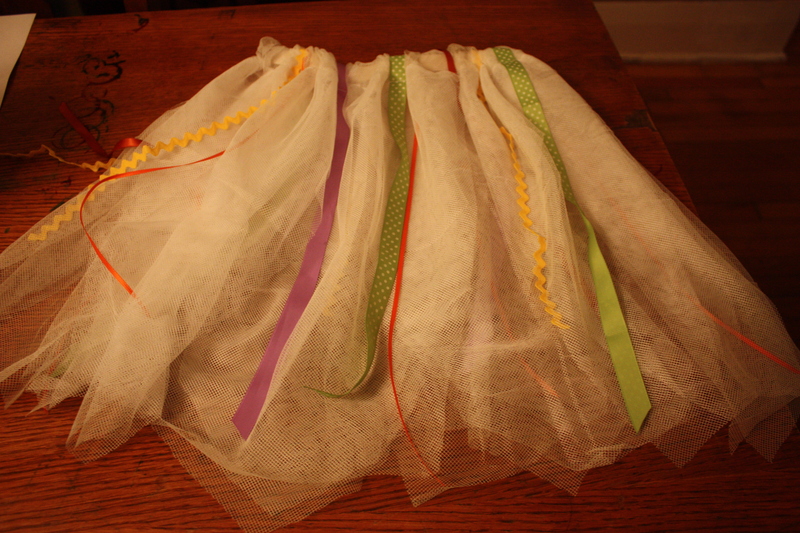 Above is a little fairy-princess dancing skirt to flit through imagination-land in. I used a section off an extra set of $6 Ikea net curtains I have lying around and raided my extensive ribbon collection. And ric rac. I do so love ric rac, I aspire to expand my on-hand collection. I love making something that’s princessy but not Disney-princessy (shudder). Just generally wafty and floufy (technical terms, I’m all about them), cause really, it’s all about how that fabric feels when it grazes your legs, that’s what makes me feel the most magical or royal anyways. Then of course one needs a general sceptre or wand at hand. 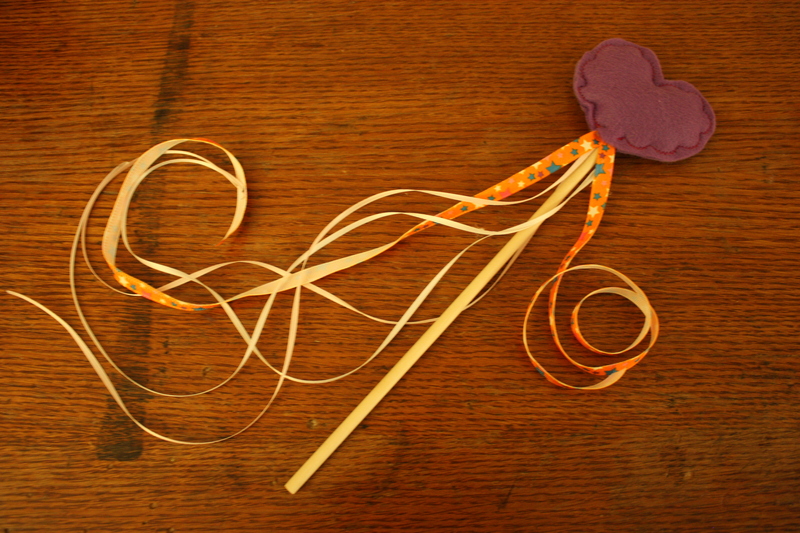 This one I made for the princess and pink loving friend of Rudi’s — error, I had no pink felt so I went with purple. This was not the best choice but I think she may accept it eventually! I had to add the orange star ribbon for a bit of sass. Reports are that her 3-month-old sister is mesmerized by the ribbon movement, unexpected bonus! 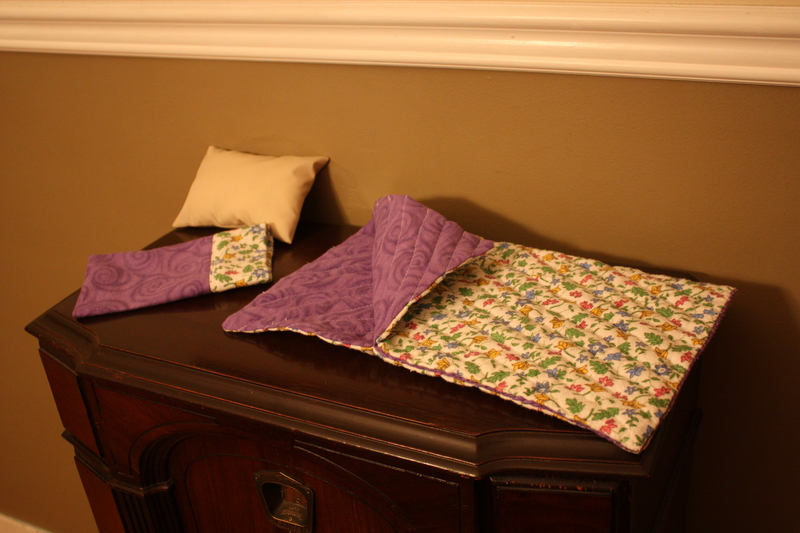 And lastly, for Rudi’s friend who loves purple and dolls (she’s always got one in tow and cares for them like her own kids), I made a little sleeping bag and pillow set. It was so much fun and took me back to the days when I’d envision, concoct, create and finish a project over the course of a lazy weekend day as a kid. Back when a day 0ff seemed endless and rolled past slowly and deliciously, ripe with possibility. I guess that’s what it comes down to when I sew for girls specifically, it’s a little trip down memory lane, close to my heart and my own experience. This may be the oldest project of mine that I ever manage to feature here on Rearview Fridays! It’s a doll I made for a high school project, circa 1994. 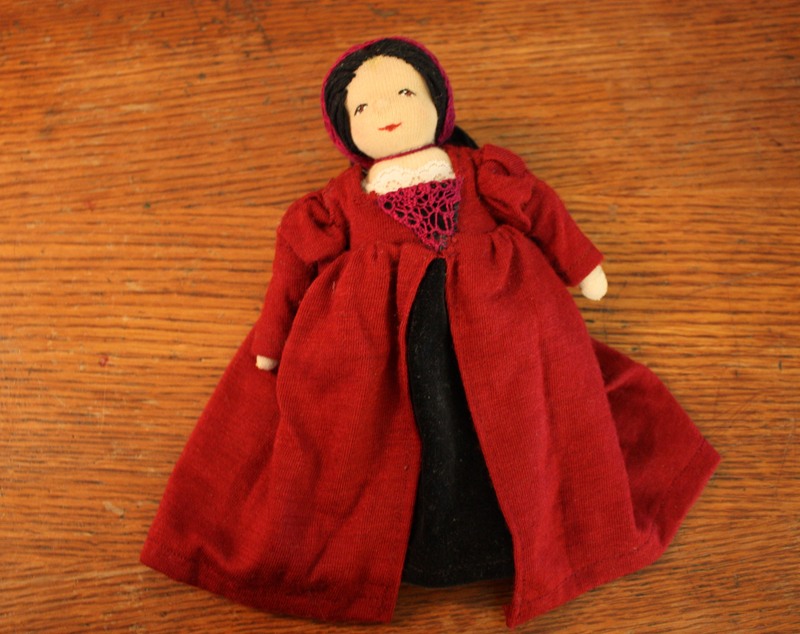 I remembered her when I featured a couple of other dolls I’d made a few years ago on a recent Rearview Fridays post. I can’t believe she’s in such good condition and that I’ve managed to carry her with me all these years. In Alberta’s grade 10 English curriculum, Shakespeare’s Romeo and Juliet was par for the course. I had as awesome English teacher, Mr. Young, hands down the most inspiring teacher of my high school career. He was a great juxtaposition of art and jock. He’d been a wrestler in his youth, injuries sustained made him walk with a roiling gait, and he had these giant forearms. He was also passionate about basketball, running a huge national invitational basketball tournament every year. On the other hand he taught English, was the head of the department, and ran the school’s Shakespeare Club (of which I was a member of course). And he was utterly passionate and practical about language and stories and history. Every year he assigned one project where we could do anything BUT write an essay. Our teenage-minds were blown! It was an arts high school, called Victoria Composite High School at the time and we were exploding with creativity. The excitement was palpable for this assignment in the 10AP class. I think I learned more about Shakespeare and Romeo and Juliet and their times because of this project. 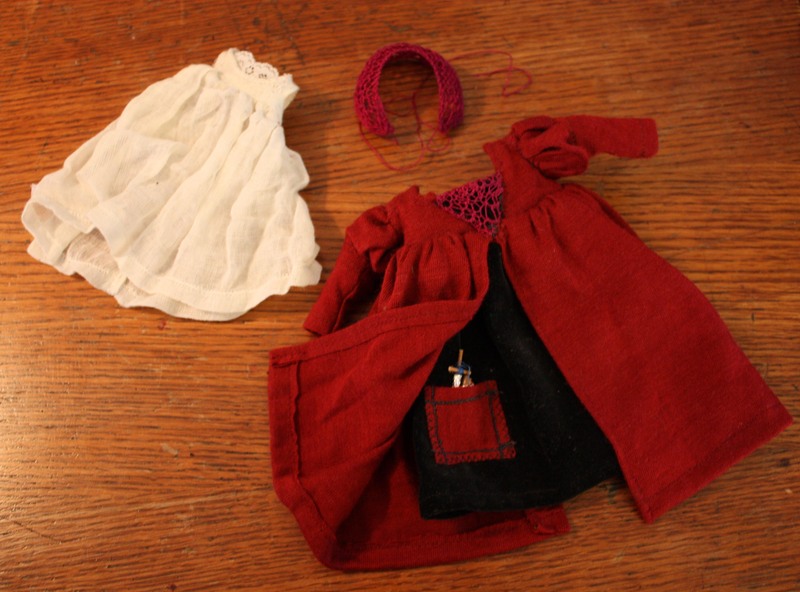 I researched clothing, costumes, hair, payed close attention to the details of the play. One girl made a dance film, monologues were performed, a guy even forged a sword. Forged a sword! 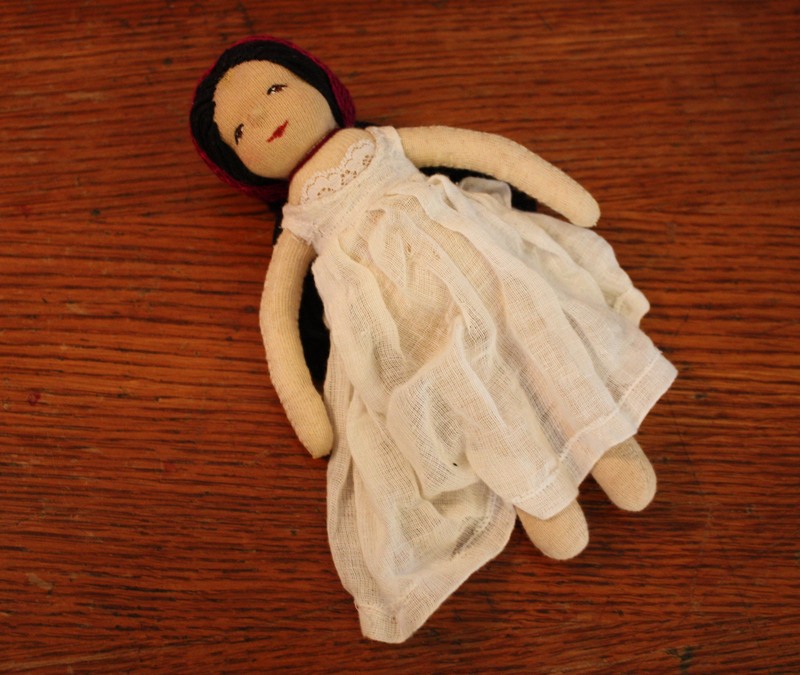 I made a Juliet doll — shocking, I know. As I look at her today, I am amazed at my 16-year-old self. 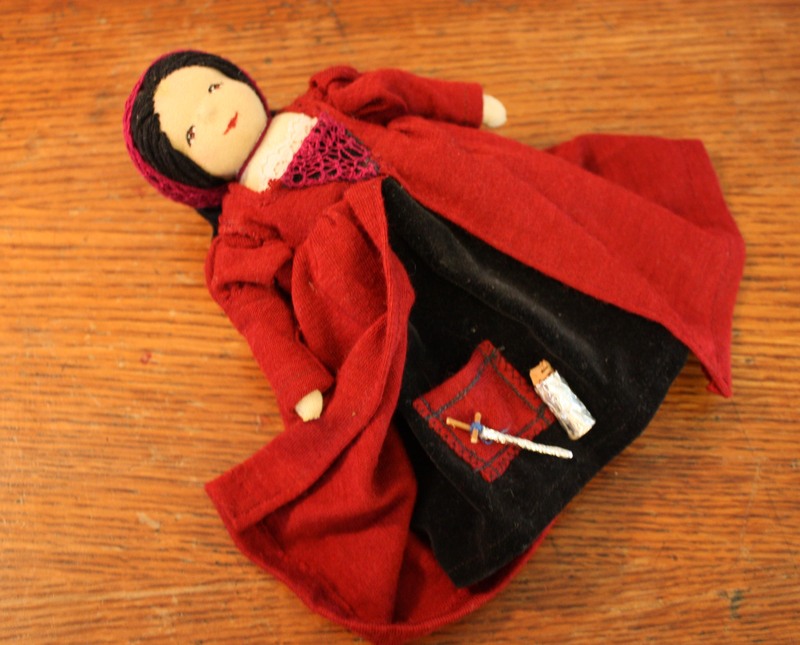 I started with a basic Waldorf doll, which I figured out myself by looking at other ones. I remember being so proud of how her eyes came out, painting lips and irises with such care. I picked natural fibres like cotton, wool and cotton velvet, dyed the fabric for her skin with tea, did a lot of the stitching by hand. 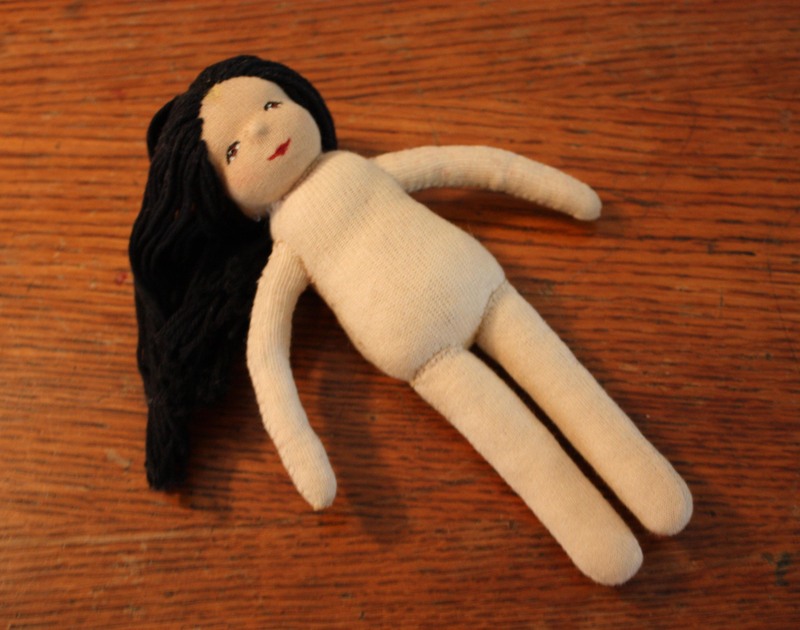 Her hair is black cotton yarn, thick and waist-length. I crocheted burgundy lace for her dress, I even crocheted a snood, a freaking snood! I want to squeeze my overachieving, unstoppable self from 1994, tell her that she’s awesome. That she shouldn’t take the next 16 years to really feel comfortable in her skin because she’s great, extraordinary as is. Juliet has a little lace and cheesecloth slip that ties at the back, it’s so sweet and innocent. Her dress is rich and heavy and closes with hooks and eyes at the back. Then to top it all off there’s a secret pocket under the top layer of the dress with a wee foil dagger and a corked foil vial, which, of course, has green beeswax in it so if you uncork it you see “poison”. Of course. Cause I like details. Ahem. Mr. Young really believed in me and encouraged my shy, unsure self to trust my natural writing abilities. I am still surprised that I ended up working as a writer editor and administrator at a magazine for over 10 years without planning or training in that direction, but I think a lot of it has to do with some seeds of trust and inspiration planted in me by Mr. Young. I am forever grateful. I’m also amused to remember that I simply am a creative creature, it’s who I’ve always been and who I am delighted to continue to be. Cheers Juliet. Thanks for the memories.